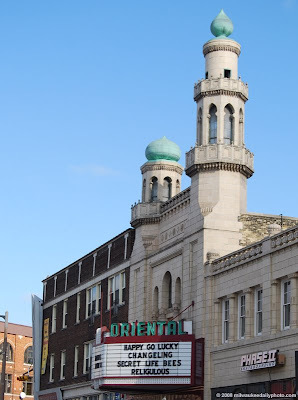 The Oriental Theatre was built on the east side in 1927, and is one of the true jewels of Milwaukee. Its interior and exterior Indian decor is rare among theatres in the U.S., and its Kimball Pipe Organ is one of the largest in a theatre anywhere in the world. I remember going to the Oriental as a teenager in the 80's to see a Who double-feature, and I don't think I've been back since (I lived out of state for 14 years, so give me a break!). I was seriously disappointed when I heard that the theatre was turned into a triplex, but it seems like the main theatre is still there in all its resplendant glory. Rocky Horror Picture Show, anyone? Right next to two of my favorite places in the city. Phase II and The Landmark. I love the one armed ID checker at the Landmark and the humor of realizing that no one knows how to manually score bowling anymore.